The episode of Christ’s entry into Jerusalem gave rise to several masterpieces in the pictorial art of the Italian Trecento in the first third of the century (Giotto’s frieze in Padua, Duccio’s predella panel in Sienna, Pietro Lorenzetti’s fresco in Assisi). The Neapolitan miniaturist drew upon the canonical model of the great Tuscan masters for the illustration of Matthew’s text glossed beneath the illumination, although all four evangelists related the event. 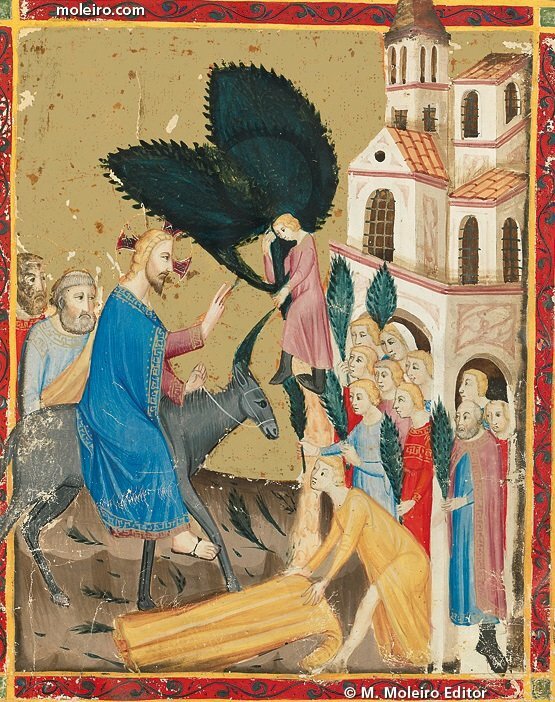 Thank you to Moleiro.com for providing us with these two images – you can visit their website to learn more about these two manuscripts and the facsimile versions they sell of them.